A recent study shows that 19 per cent of the British shop just to counter boredom. As many as 10 per cent say that they shop to relax after a stressful day. As soon as I finished going through the article, I tore it and rushed to the kitchen to burn it so that this scientific study doesn’t get into my wife’s hands. My wife barged in and declared grandly, "I am feeling very listless and lethargic today. I must shop immediately to regain my energy". Since she had not gone through that UK study yet so I guess, to shop must be a kind of international female virus which empties the hubbies’ bank balances. I sat on internet to find some remedial measures for this illness. God is great. I soon came across a news item wherein it was mentioned that scientists are working on developing a pill that can curb the urge to splurge by more than 50 per cent. This pill will kill the urge to buy impulsively. I am sure that if sufficient funds are created for research work, scientists will soon come out with instant sprays to kill your shopping enthusiasm. 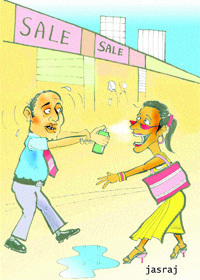 Imagine your wife getting ready for a hectic shopping session and you offer her the perfumed medicated spray. As soon as she applies the anti-shopping perfume, she suddenly declares, "Darling, can you help me get the suitcase out of the attic. I want to wear the sari you gave me on our anniversary 10 years ago. I have so many saris and I don’t need to buy a new one for at least a year". I am sure husbands all over the world will salute scientists who has made one of the greatest discoveries of the world, next probably only to the invention of fire and the wheel.